Leandro Lo tries passing Lucas Lepri’s guard in theo IBJJ Pro 2012 lightweight final (Photo by Ivan Trindade/GRACIEMAG). That’s right, another year has run its course and you’re not getting any younger. But look at the bright side: it’s the start of a new season, and there are plenty of great challenges awaiting you down the road. In Jiu-Jitsu, the season is a promising one as well, with a number of likely clashes of stalwart grapplers who have but one thing on their minds: to be the best in the world, no matter who gets in their way. As a tribute to them, to fans and to Jiu-Jitsu, what follows are 13 riveting match-ups on our wish list for 2013—with time limits, without time limits, to the finish or for gold at the Worlds. What do you think of them? Any missing? Let us know below or on our Facebook page. The rematch between Rodolfo Vieira and Marcus Bochecha is, of course, one of the most heavily anticipated of 2013. But it’s not unprecedented. How about a clash between former absolute world champions Rodolfo and Roger? 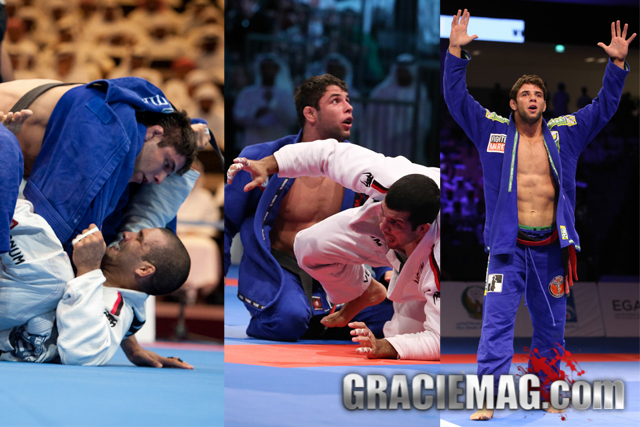 The lightweight world champion and the Gracie phenom have crossed paths in the past. And this year they may find themselves across the mat from each other again, at ADCC 2013, which will likely go down in Brazil next November. Can you imagine the silence in the Ibirapuera arena as the crowd waits for Leandro Lo and Kron to step onto the mat and lock horns? Eerie. Another promising one that could come true at ADCC 2013. Is there any doubt sparks would fly if two of Jiu-Jitsu’s most technical little guys finally collide? Let’s keep our fingers crossed. Part of the ADCC’s awesomeness is that the organizers make unlikely matches between gi-clad mat wizards and MMA aces come true. Another of the GRACIEMAG.com crew’s dream match-ups: heavyweight world champion Leonardo Nogueira versus under-99 kg ADCC champ Dean Lister. Who takes this one? Now sporting brown belts, the Miyao brothers will be heading to Abu Dhabi to show they’ve got what it takes to grapple with black belts on even terms. One of the most intriguing hypothetical match-ups would be between the Miyaos and the Mendeses. Who’s got the deadlier guard? Whose berimbolo packs more razzle-dazzle? The way our team sees it, Gui Mendes and Paulo Miyao would be a sight to behold for anyone intrigued by the study of modern Jiu-Jitsu. Brown belts squaring off with black belts always makes for good viewing. Does the reigning medium-heavyweight world champion, Rômulo Barral, have anything to teach up-and-comer Keenan Cornelius? If we’re lucky, we’ll find out in Abu Dhabi or at the ADCC. 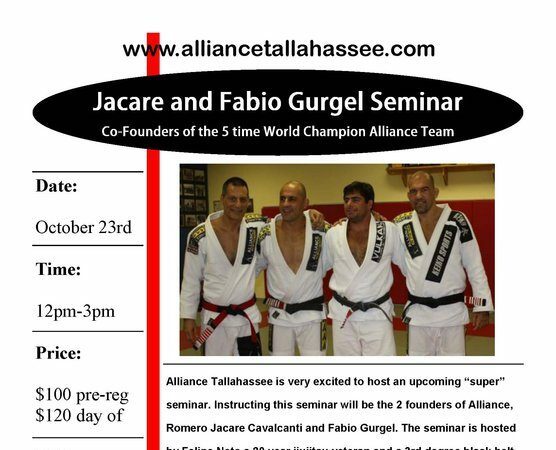 This all-coach showdown is one of the big attractions on tap for ADCC 2013 in Brazil. What have the two monsters of guard passing got in store for each other and the crowd? Friends and rivals from way back, André Galvão and Bráulio “Carcará” are the stars of the ADCC marquee supermatch. The winner will go on to face the absolute champion when the 2015 event rolls around. The loser will be stripped of his post as No-Gi king and relegated to competing in the regular divisions. Who wins it? How? Brace yourself for technical fireworks. A clash of the old guard and new generation, guard player and passer—truth is, Xande and DJ have what it takes to make a match-up between them a lot more than just that. May 2013 bring this great bout. At Metamoris Pro, Lovato put on a categorical performance and stretched Kayron’s arm to its full extent. How would a 2013 rematch between the two play out? Will Tererê indeed return to top-flight competition in 2013? We’re yearning for him to. And our hope is he’ll do swell against the cream of the current middleweights crop, like Clark Gracie, or Alan Finfou, or Victor Estima. Will we be seeing that trademark hook-sweep back making stalwart black belts take flight on the big stage again? 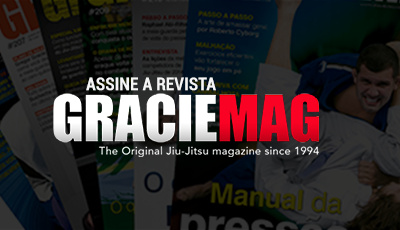 Could the newly promoted Gracie Humaitá black belt dethrone Alliance frontrunner Luanna? War looms on the horizon! Carol, a mainstay of Gracie Humaitá’s female team, was one of the last ladies who, through great agility and well-oiled technique, managed to overcome the overpowering presence of Gabi Garcia, back when the two were still purple belts. A re-encounter between the two, at black belt, would be a monumental moment for 2013.